Sometimes books don't need to have massive plots to be enjoyable. 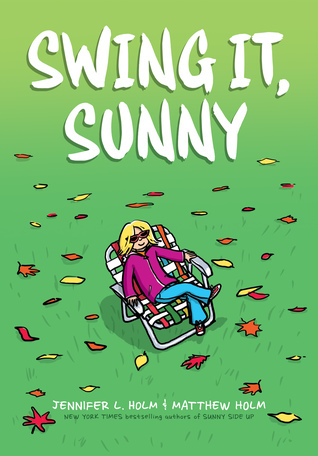 I think the best word for Jennifer L. Holm and Matthew Holm's Swing It, Sunny is 'serviceable'. It will be popular because it's a graphic novel about a middle school student, but it isn't going to win any awards or blow anyone away. In the first book, Sunny Side Up, our main character's older brother is constantly in trouble. In this sequel, Dale has been sent to military school, but he has a large presence in the house. 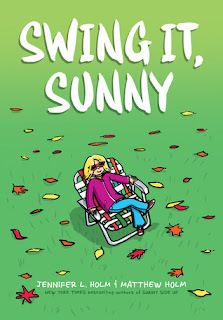 Sunny and her parents tiptoe around discussing him, although at times it seems like there is a spotlight on Dale's empty chair, as depicted in the illustrations. I think this will be so relatable to many readers who have family members that aren't in the house. There are no easy solutions in the book, which is also realistic. The big lesson seems to be that life carries on, no matter what. For middle grade readers (and all of us), this can be an important reminder.